Live Nation announced today that music icon, Grammy Award winner and Rock & Roll Hall Of Fame Member, Neil Diamond, will celebrate his unparalleled career spanning 50 years with a world tour. The 50 Year Anniversary World Tour, produced by Live Nation, will begin April 7 in Fresno, CA and will visit cities across North America including New York City, Los Angeles, Chicago, Toronto, Vancouver, Tampa and more as the incomparable artist performs songs from his iconic discography. North American tour dates are listed below. Europe and U.K. dates to be announced soon. "Neil Diamond is more than just a music icon. His singular artistry and talent has left an indelible mark on American culture and has helped shape the sound of popular music for five decades," says Michael Rapino, President and Chief Executive Officer of Live Nation Entertainment. "Live Nation is honored to be a part of bringing his 50 year anniversary tour to fans around the world." 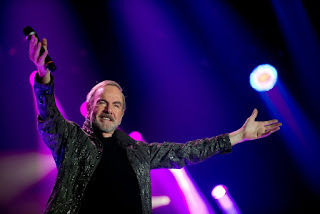 Throughout an illustrious and wide-ranging musical career, Neil Diamond has sold over 125 million albums worldwide and has charted 37 Top 40 singles and 16 Top 10 albums both in the U.S. and internationally. A Grammy Award-winning artist, Diamond is a member of the Rock and Roll Hall of Fame, the Songwriters Hall of Fame and a recipient of the Sammy Cahn Lifetime Achievement Award, one of the highest honors bestowed upon songwriters. Diamond's many other achievements include a Golden Globe Award, 13 Grammy nominations and 2009's NARAS's MusiCares Person of the Year award. In 2011, Diamond received the prestigious Kennedy Center Honor for his lifetime of contributions to American culture.